Evoke the beauty of relections on water, using your new found oil painting skills in this four hour beginners class. Oil painting can feel like an intimidating medium to a newbie, but this class will cover all the basics to get you started. You will get familar with the materials used, understand the how to utalise colour theory in a painting and look at composition, tone and texture in your work of art. Even if you’ve completed an oil painting course with Work-Shop, the painting and the subject matter are always different – so you’ll always be learning something new! All materials are provided, with expert guidance by the way of Christopher in our inspiring creative space to get you feeling like a true artist for the day. You’ll leave with a beautiful work of art that you would be proud to hang in your home, plus feel accomplished having learnt some mad new skills to continue using for years to come! All materials needed… brushes, palettes, and paints! Wear clothes you don’t mind getting paint on, or an apron. Christopher Vidal is a Sydney based professional artist. He studied classical arts including drawing and sculpture at the School of Arts at Palazzo de La Salle in Valletta, Malta. After finishing his academic studies Christopher worked as a medical researcher in Malta and Australia. During this time he also continued to develop his skills in painting mainly working in oils and acrylics. 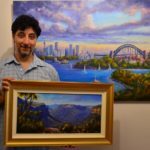 His current works mainly consists of Australian landscapes in oils. He is inspired by the style and techniques of the classical realist painters such as Caravaggio and Dutch painters as Rembrandt. He is also inspired by the American painters of the Hudson River School and the Australian impressionists of the Heidelberg Art Movement. His works of art brings together classical realism from Europe and US as well as Australian impressionism.